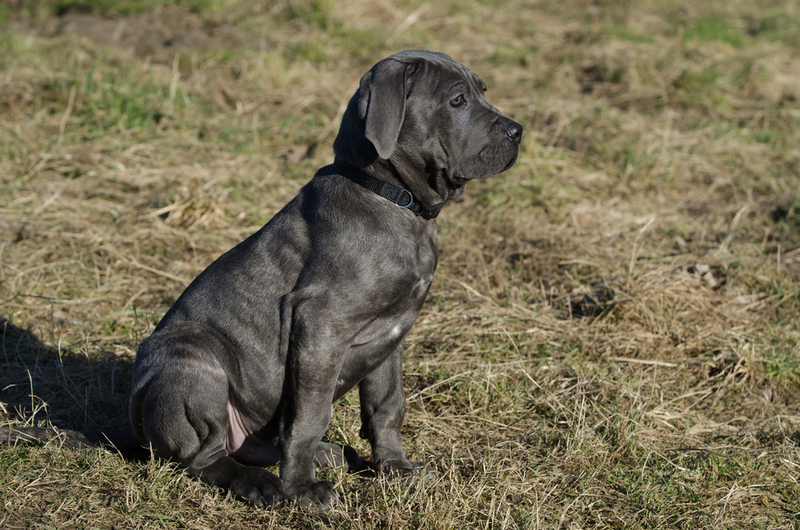 If you are a big dog lover, chances are, you’re already familiar with the Neapolitan Mastiff. One of the largest breeds in the world, these big dogs are quite popular among the big-dog crowd and they have a significant number of devotees. But while it is important to think carefully about adding any breed to your family, this is especially true of gigantic canines, who may even weigh more than you do. We’ll delve into the details of the breed below and try to explain some of the basics of their health, personality, build, tendencies and more. Hopefully, this will help you decide if one of these large and lovable dogs would fit in well with your family. The Neapolitan Mastiff breed was created in southern Italy from a collection of different mastiff-type dogs. The early creators of the breed sought to create a gigantic dog with thick, loose skin that would provide some protection against the threats that these dogs were expected to confront. Given the breed’s modern appearance, they certainly succeeded! The breed became somewhat popular in Europe during the 19th century, and their popularity continued to grow during the early portion of the 20th century. However, they didn’t make their way to the United States until the 1970s, and they only received AKC recognition in 2004. Neapolitan Mastiffs are gigantic dogs. They’re among the largest breeds in the world, and although they vary in size, it is important to know what you’re getting before you add one of these dogs to your family. Neos usually stand between 2 and 2.5 feet tall at the shoulder, and they have a large build. You can easily appreciate their mass by simply looking at them. Most weigh around 150 pounds or so, but the smallest females may only reach 120 pounds, while the largest males may exceed 200 pounds. SEE ALSO: What is the Biggest Dog Breed in the World? Neapolitan Mastiffs are often called “gentle giants.” In most respects, this is a very accurate characterization. These dogs are generally very gentle, although the may throw their weight around a little when trying to get their way. Most are very loving and affectionate with their families, and they tend to form very strong bonds with those they’re close to. They’re rarely defensive or aggressive when meeting unfamiliar people, although they do often remain a bit aloof until they get to know new people. Neapolitans are generally very gentle with children, although supervision is always required, give their large size. While most would never consider deliberately harming children, they’re sometimes clumsy dogs, which can lead to accidental injuries. Although they don’t have the protective instincts of Rottweilers, Cane Corsos or some other breeds, they won’t hesitate to put their massive bodies between their families and perceived threats. At any rate, their large size will deter all but the most determined (or ill-advised) criminals. This breed will test their owner’s boundaries, so it is important to establish a proper hierarchy early in their lives. However, they are sensitive souls, so fair treatment and positive reinforcement should always characterize your approach to these dogs. Neapolitan Mastiffs are usually pretty healthy dogs, and they have relatively long lifespans for such a large breed (most large breeds have shorter lifespans than small breeds). Nevertheless, they are susceptible to a few common health problems, which you should familiarize yourself with before you add one to your family. Hip and elbow dysplasia are two of the most common health problems that afflict the breed. These problems occur when a dog’s hip or elbow joint fail to develop properly. This often leads to pain, inflammation and, eventually, reduced mobility. Hip and elbow dysplasia can be addressed surgically, but it is preferable to obtain your pet from a breeder who screens his or her breeding stock for these issues, so you can avoid the problem entirely. Neapolitan Mastiffs can also suffer from ectropion (a condition in which the eyelid rolls inward and irritates the eyeball) or cherry eye (which causes the dog’s nictitating membrane to bulge outward). Additionally, because they’re covered in loose, baggy skin, these mastiffs occasionally suffer from skin infections when not kept clean and dry. 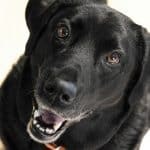 Neos will usually thrive when provided with the same kind of care most other dogs receive, however, because of their immense size, you will need to do a few things differently. We’ll discuss their care requirements in greater detail below, including information about their dietary, exercise, training and grooming needs. Because they reach such large sizes, this breed will have different food requirements than most smaller breeds do. They still require a food that meets or exceeds the AAFCO guidelines, but they also require a food that specifically addresses the nutritional needs of large breeds. We discuss a few of the best large-breed dog foods here, which should help you narrow down your focus. It’s also wise to look for a food that is fortified with joint-supporting supplements, such as omega-3 fatty acids, chondroitin and glucosamine. 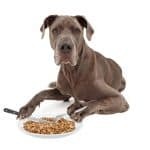 If you are unable to find a food you like that contains these supplements, you may want to pick up a standalone supplement to help protect your Neapolitan mastiff’s joints. Mastiffs are also susceptible to weight gain and obesity. Given their predisposition to joint problems and their already-large size, this must be avoided at all costs. Be sure to work closely with your vet to monitor your pet’s body weight and make adjustments to his diet as necessary to keep him within the recommended range. Neapolitan Mastiffs are very large dogs, with a gait that’s often characterized as “lumbering.” This leads many to assume that these are low-energy dogs, who don’t require a lot of exercise. However, this isn’t an entirely accurate picture. In actuality, these dogs have moderate energy levels and exercise requirements. They aren’t as lazy as English bulldogs, nor are they as energetic as huskies. 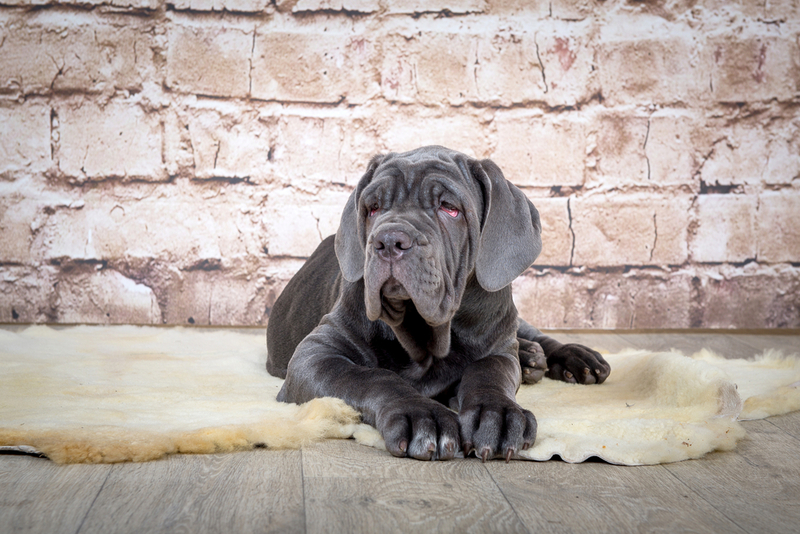 A Neapolitan mastiff will certainly love spending hours lounging on the couch with you, but they’ll also need to enjoy regular walks and a moderate amount of playtime. You don’t want to force one of these big-boned, heavy dogs to run for miles, but daily walks are imperative. Most won’t want to fetch a ball, and they aren’t very good swimmers, so playtime will usually consist of trotting around the backyard. It is important to train all dogs, but it is especially important to ensure that large (and, in this case, gigantic) breeds are properly trained. This will not only help make your dog easier to manage, but it also has important safety connotations when very large dogs are concerned. You can start part of the training process – housetraining – the very first day you bring your new dog home. Like most other large breeds, Neapolitan mastiffs usually learn proper elimination protocols pretty quickly and easily. However, you may find that a high-quality dog crate will help accelerate the housetraining process. On the other hand, you’ll want to wait until your new pet is about 8 weeks of age before you begin basic obedience training. We’ve discussed some of the most important commands to teach young dogs before, so be sure to check out our article on the subject when you get started. It is also important to socialize your Neapolitan mastiff while he is young. 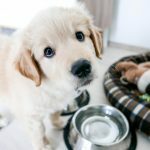 You can begin introducing him to people as soon as you bring him home, but you’ll want to wait until your vet gives the green light before you start introducing your new pet to other dogs. Failure to do so may expose your new pet to illnesses before his immune system is ready to protect him from threats. Make sure that you seek out the services of a certified trainer if you experience any difficulties training your new pet. Neapolitan Mastiffs are generally gentle dogs, but you can’t leave anything to chance when discussing dogs who may reach 200 pounds in size. The Neapolitan Mastiff has relatively short hair, and doesn’t require a great deal of shedding. They do need regular baths, and most will appreciate regular brushings, but they don’t need to go to a groomer on a regular basis. Regular baths and brushings will also help reduce the amount of hair Neapolitan mastiffs will shed in your home, but these large dogs don’t shed very much in the first place. You’ll also need to trim your pet’s nails and brush his teeth regularly. Make sure that you introduce him to these activities when he’s young; you don’t want to find yourself wrestling a 200-pound dog who doesn’t like having his paws touched or teeth brushed. Fortunately, if introduced to these things early in life, most Neapolitan Mastiffs will learn to accept tooth-brushing and claw-trimming time. It is also important to point out that the breed often drools on a more-or-less constant basis. Would-be owners who aren’t comfortable with dealing with a dog that drools all the time should probably select another breed. Neapolitan Mastiffs aren’t very common in the United States, so you may need to search high and low to find one for your family. The AKC’s puppy finder is a good starting point, but you can also contact NeoRescue Inc., which is a nationwide rescue organization that works exclusively with the breed. 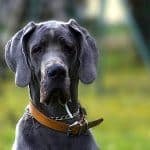 Many people interested in picking up a new puppy have questions, and this is especially true of those who are interested in an unusual breed, such as the Neapolitan Mastiff. We’ll try to address a few of the most common questions about these dogs below. Do Neapolitan Mastiffs shed a lot? The Neapolitan mastiff is usually characterized as a moderate or average shedder. They aren’t a terrible choice for those who suffer from allergies, and you can reduce the amount of hair they shed in your home by brushing them outside once a week. Do Neapolitan Mastiffs like to swim? Some Neapolitan mastiffs like to play in the water and swim. However, given their build, they’re rarely strong swimmers, so you’ll always want to use caution when allowing one of these dogs to swim. The Neapolitan mastiff is typically gentle with his family, but he usually remains on perpetual alert for threats or danger. With proper training, the Neapolitan mastiff can serve as a very competent guard dog. While they will not hesitate to meet threats head-on, Neapolitan mastiffs are typically not aggressive dogs. 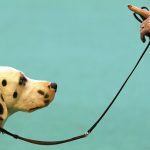 Nevertheless, proper training and early socialization are critical for these large and incredibly strong dogs. Is this breed legal to own? The Neapolitan Mastiff is not banned at the federal level in the United States, but the breed is banned in some cities and towns. Accordingly, you’ll always want to investigate the laws in your area before adding one of these dogs to your family. 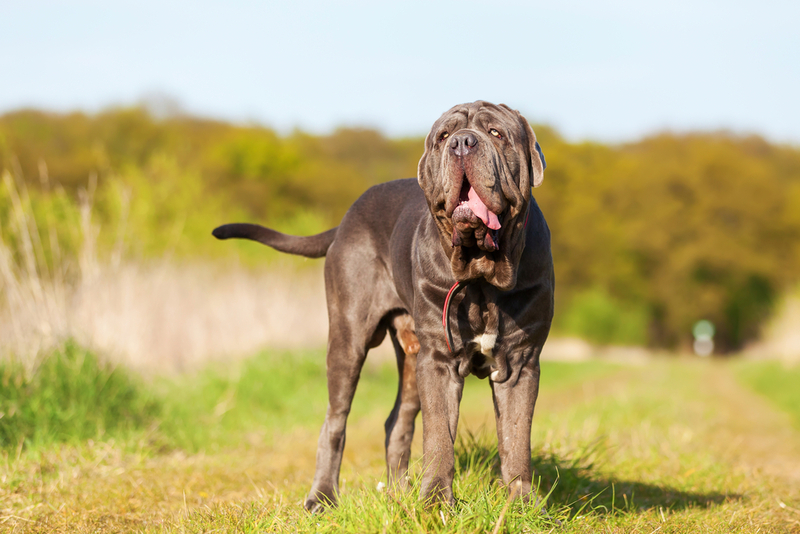 Wrapping Up: Is a Neapolitan Mastiff Right for Your Family? 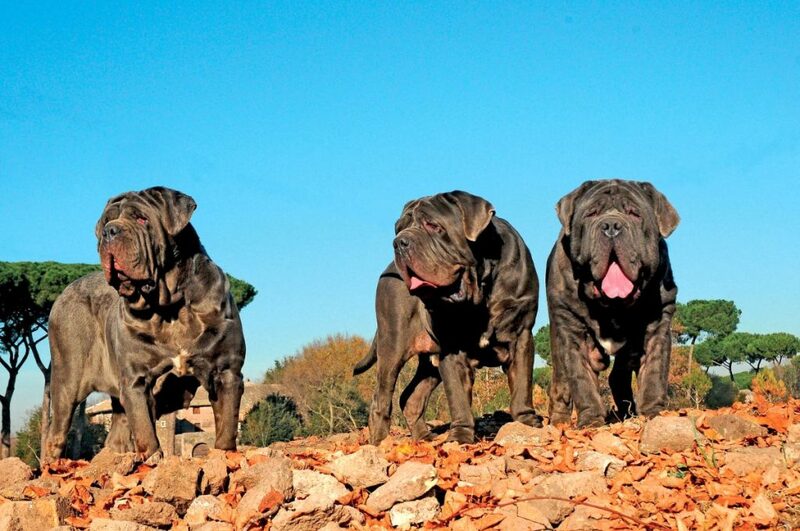 Neapolitan Mastiffs are charismatic canines, who attract a lot of attention among dog lovers. They’re certainly attractive animals, and they make an incredible impression on most people they encounter. Most live up to the “gentle giant” nickname. They generally prefer lounging with their family for most of the day, and they are usually very good with kids in the family. And while they can be stubborn and test their owner’s limits, it is always done out of child-like selfishness (or laziness), rather than malice. Your Neo may not appreciate you telling him to get off the couch, and he may protest quite strenuously, but he’d never wish his pack harm. 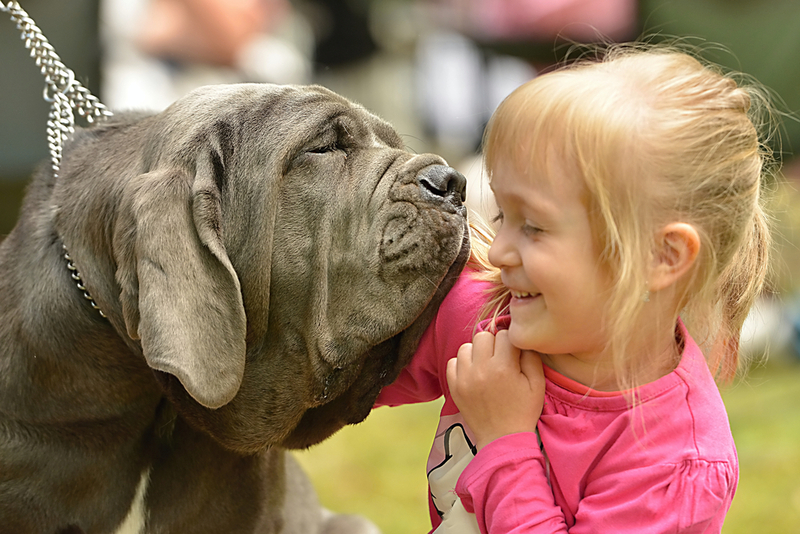 Neapolitan mastiffs usually keep strangers at arm’s length, until they’re convinced the people are friendly. They aren’t always very accepting of other pets either, which is important to consider. Given their size, they can cause serious problems for other animals in the home, so they’re probably not a good choice for homes that have cats or small dogs. 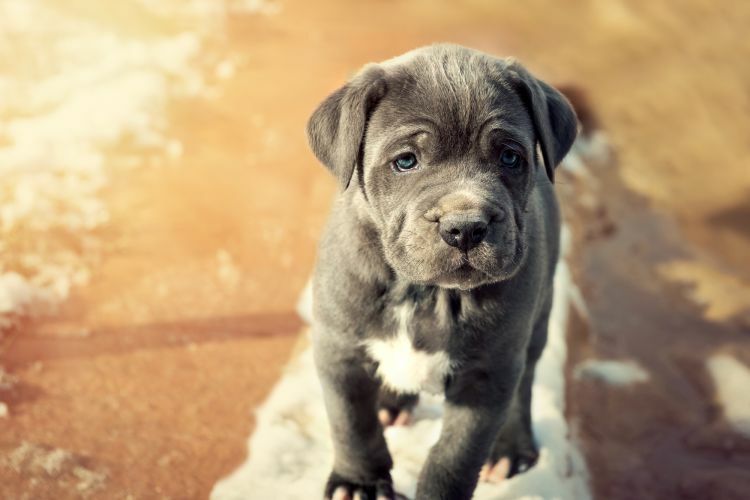 Because of their size and slightly stubborn nature, Neapolitan mastiffs are rarely recommended for first-time dog owners. But, if you have ample space for the breed, the members in your home are comfortable living with a wolf-sized dog, and you have experience training large, assertive dogs, you may find these dogs perfect for your family.